Sometimes I like to take pictures of people I see that I don’t know. That might be a little creepy. But I’m getting pretty good at it. I took two of this girl in pink, sitting outside La Sagrada Familia. I picked this one because it also includes the lady looking at her camera to the side. 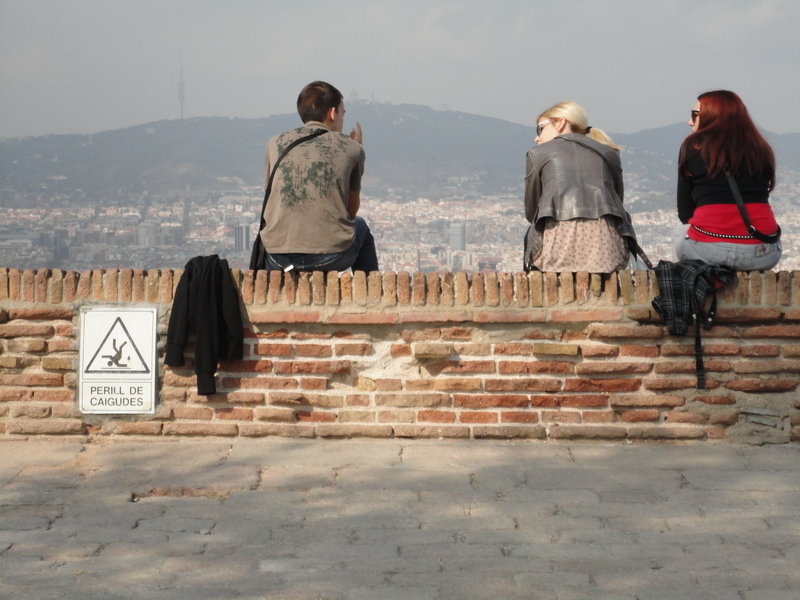 Tourists – German I think – living dangerously at Montjuiic. Two girls drawing, near Plaça Catalunya. 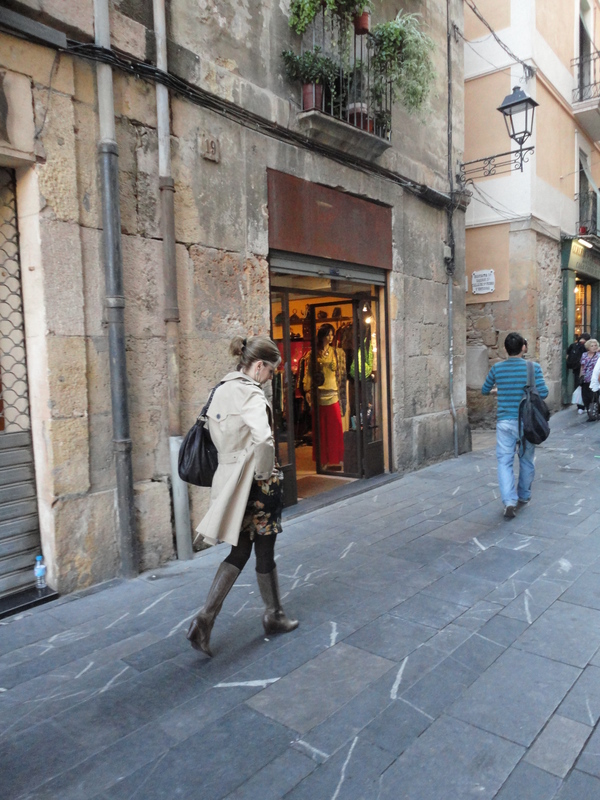 In Tarragona, a street was shut down for filming, which we did not realize until we were already in the way. As they let us pass, I got a shot of the actress, walking back to her position for the next take. I have no idea who she was or what they were filming, or even if it was a commercial shoot, something for television, or even an extensive student project or independent film. 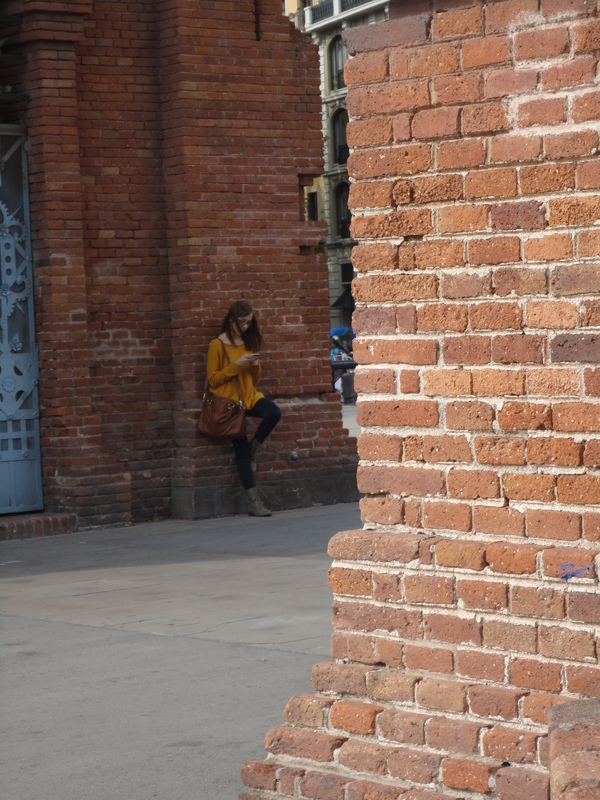 This girl was alternately checking her phone and looking around, as if for someone, under the Arc di Triomf. We invented some fiction for her, in which she was waiting to meet a young guy who was standing just out of her view on the right side of the Arc. They waited, not seeing each other.. they scanned the crowd for each other.. and then he walked under the Arc, and there was no recognition. He wasn’t the one she was waiting for.